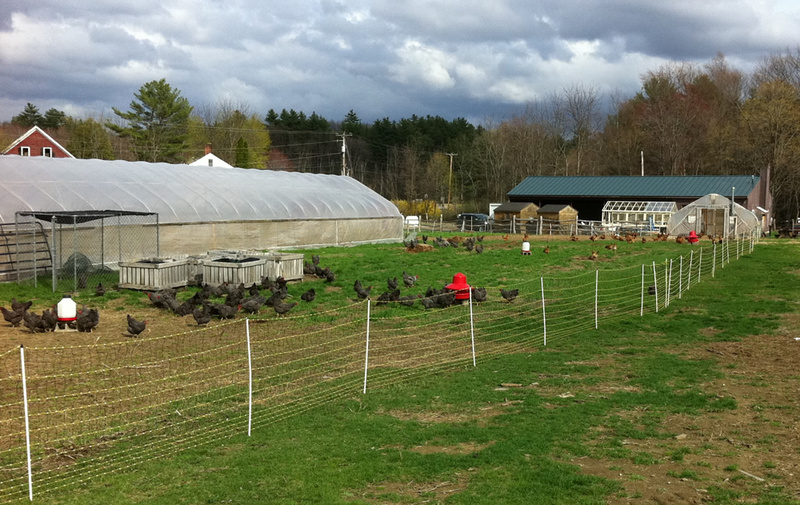 Today we connected the paddocks of our two laying flocks so the younger hens (Barred Rocks, foreground) could meet the older hens (New Hampshire Reds, background). They will all be bunking together once we get the mobile layer coop finished, so we are letting them sort out a new pecking order first. All went well. Everybody was very curious and very skittish. We witnessed a lot of bluster and games of chicken. It was so much fun to watch, we could have sat there all day. But sadly, we are behind schedule on too many other projects (like building a mobile layer coop). Luckily, the grass is behind schedule this year as well.